Task: To introduce the project in the most appealing way. 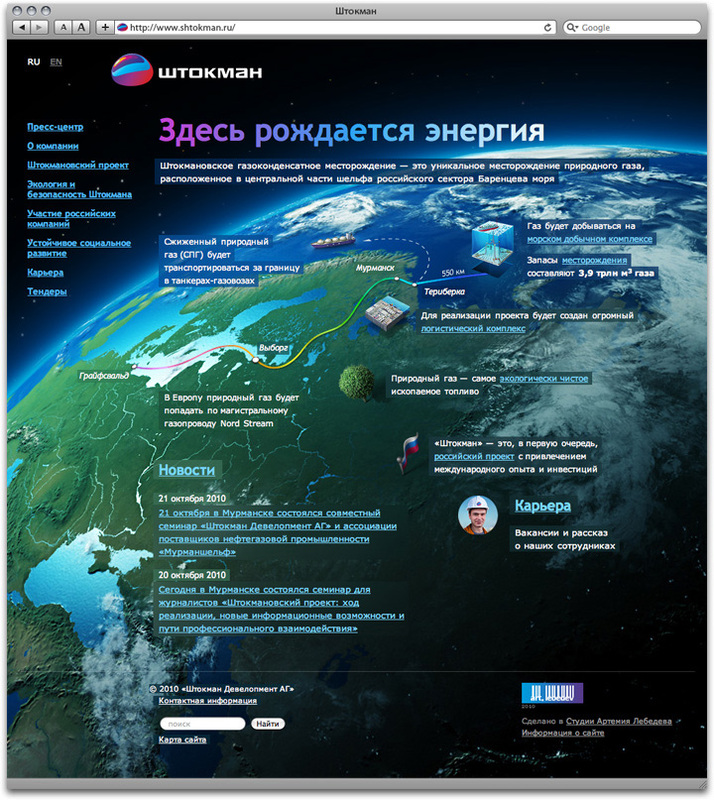 The Shtokman project is for development of the Shtokman gas and condensate field in the Barents Sea. The program encompasses the entire cycle from research to processing and transportation. New phases of this project will be launching over the next seven years in the North part of Russia. The site's front page demonstrates the geographical location of the offshore gas field and gas transportation lines for distribution in Russia and Europe. The main element of the project is an arctic offshore gas extraction complex with a floating production platform of the ship style. Another important part of the project is people collaboration. The site's task is to get more qualified people involved. Potential job seekers are getting their future job description through exciting pie-charts.